Maybe you’re trying to find something useful for your homework, or maybe you’re just gathering information for a vacation to Italy: whatever the reason that caused you to land on this page, you should find the Medici family timeline extremely useful, as it is a summary of the history of the most powerful family of the Renaissance. 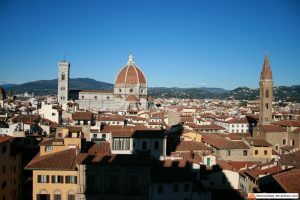 On top of this, you will find many more detailed information on the Medici family in this website. We have the best Medici family tree you can find online, and it’s interactive (you can click on the images to read a biography of the characters). We also have another infographic relating the Medici history to the early Renaissance in Florence so that you can place each important work of art in the right context. We have detailed biographies of the members of the family (that we are consistently updating with more info) and also pages that help you to identify the object of your search, given that the family used the same names over and over. 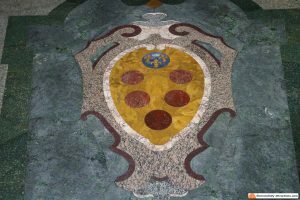 Finally, we also have information to share about the Medici coat of arms, with all the theories on the meaning of this symbol. All of this can be found in our Medici family category. The House of Medici has been one of the most important families of the Italian Renaissance. 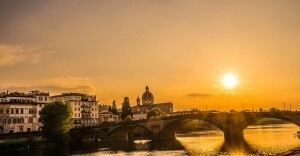 Rich bankers and merchants, the Medici have ruled the city of Florence for three centuries. Two members of the family have been Popes while two more have been Queens of France. In their long history, the Medici also had to face several conspiracies. The Medici have been generous patrons of arts, decisive for the development of Renaissance in Florence. Among the artists sponsored by the rich bankers, are Filippo Brunelleschi, Donatello, Filippo Lippi, Sandro Botticelli and Michelangelo, just to name a few ones. The following infographic presents the Medici family timeline simplifying the otherwise complex history of the family. The dates represent the most important events in the history of the Medici family. For more information, navigate to the Medici family category to find detailed posts.